This novel was published a full 14 years before the sinking of the Titanic, but listeners may be surprised at how many parallels this fictional tale has with subsequent true events. The Titan is the largest and most technologically advanced steamship of her time. She is considered unsinkable. Her full speed crossings of the Northern Lane Route carry her rich passengers in the highest standards of luxury and comfort. The less well-off travel in rougher quarters but still benefit from the speed of travel. These crossings, however, are fraught with navigational hazards, the greatest of which is ice. Unlike the ship, one member of her crew is not of the highest standard. At least, not anymore. John Rowland is a broken man who drinks to forget his past. However, when the Titan crashes into an iceberg during her attempt to break a speed record, he is forced to confront his past. Can he overcome his enemies and escape as the ship begins to sink? And can he make his way back to civilization and find self-respect once more? Adventure and soul-searching await Rowland, with a surprise ending. . . .Who says so—how do you know it?" blustered the captain. "You have only that bulletin statement of the man Rowland—an irresponsible drunkard." "The man was lifted aboard drunk at New York," broke in the first officer, "and remained in a condition of delirium tremens up to the shipwreck. We did not meet the Royal Age and are in no way responsible for her loss." "Yes," added Captain Bryce, "and a man in that condition is liable to see anything. We listened to his ravings on the night of the wreck. He was on lookout—on the bridge. Mr. Austen, the boats'n, and myself were close to him." 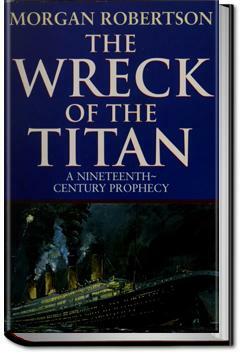 In this review I will discuss two things: 1) The story of the Titan as it relates to the wreck of the Titanic and 2) This 1994 reprint, and the author's actual writing skill, on their own merits. Having been interested in the Titanic for as long as I can remember I had often heard of this story and the uncanny similarities between the Titan and the Titanic. It was only recently that I actually got hold of this book and read it though. It's the story of the grandest ocean liner to sail the Atlantic. She sails fast through the cold water on her maiden voyage. On a clear night, she ends up hitting an iceberg and sinking. Only a few people make it to the lifeboats and there is a great loss of life. Tanrı'nın bile batıramayacağı gemi sloganıyla yola çıkan RMS Titanic 15 Nisan 1912'de, Kuzey Atlantik'te, gemi saatiyle 23.29'da buz dağına çarparak batmasına kadar giden facianın ilk adımı atıldı.